Come out to Grapevine on September 13, 14, 15 and 16, 2018 for the 32nd Annual GrapeFest - A Texas Wine Experience, presented by Bank of the West! 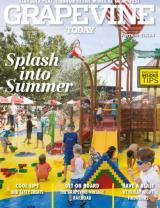 The four-day event is the largest wine festival in the southwest and features premium wine from Texas. This year, the festival will also showcase guest wineries from North Coast California and the Rioja Region of Spain. Attendees can participate in events such as the "People's Choice Wine Tasting Classic," the largest consumer-judged wine compeittion in the United States; "GrapeStomp" competition for the opportunity to win the highly-coveted Purple Foot Award and the Champagne Cork Shoot-off. 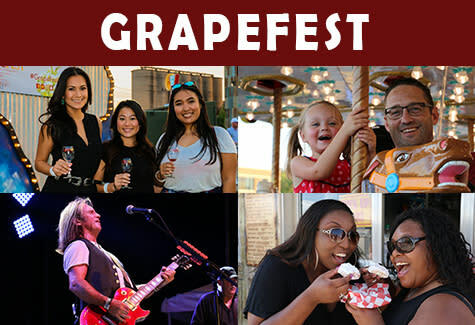 GrapeFest also features three-stages of live entertainment, roving entertainers, "KidsWorld" with vendors such as SEA LIFE Grapevine Aquarium & LEGOLAND Discovery Center, carnival and midway, delicious festival foods, unique shopping and more! There are also several pre-festival events such as the GrapeFest Golf Classic, 15th Anniverary ItalianCarFest, Texas Wine Tribute gala and wine pairing dinners leading up to the festival. GrapeFest takes place in Historic Downtown Grapevine on Main Street.